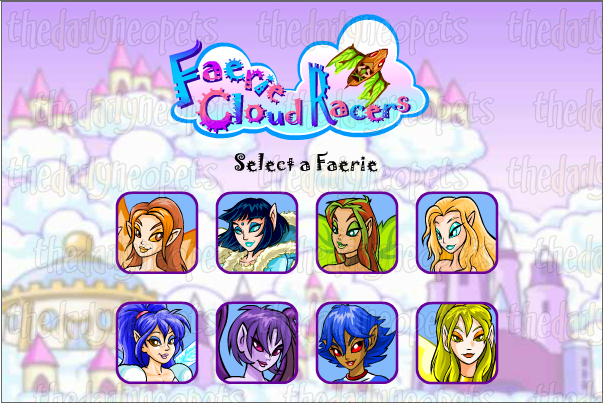 Faerie Cloud Racers 2 is a game of survival for one or two players. The goal of the game is to survive longer than your opponent by avoiding crashing into buildings, racer trails or each other. One great thing about this game is that you have the opportunity to choose the controls that are most comfortable to you. To choose which key controls with direction, simply click the"options" menu from the start screen then click the "key box" (the dark grey one) of the direction you want to change the key for and press the key you want to control that direction. Below are the default settings. If you are playing a 1-player game, the arrow keys control their respective directions. The same is true if you are playing as player one in a 2-player game. 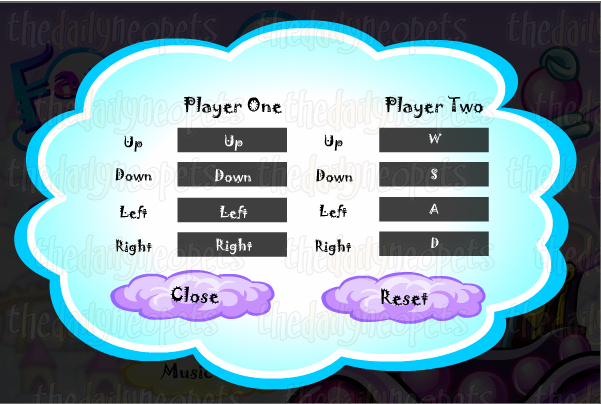 If you are playing a 2-player game, the default controls and their directions are shown below. Once you choose your controls at the beginning of the game, they cannot be changed until you begin a new game. It is also worth mentioning that neopoints will only be awarded when playing in 1-player mode. The actual gameplay is fairly simple. Use the direction keys to control your racer and try not to crash into anything. You must defeat each opponent 3 times to move onto the next round and the next challenger. Sound simple? There are different obstacles you need to watch out for. 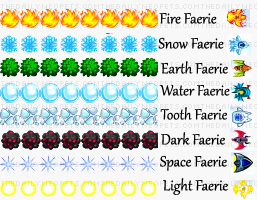 In the example below, I have chosen to play as the Fire Faerie and face the Snow Faerie in the first round. 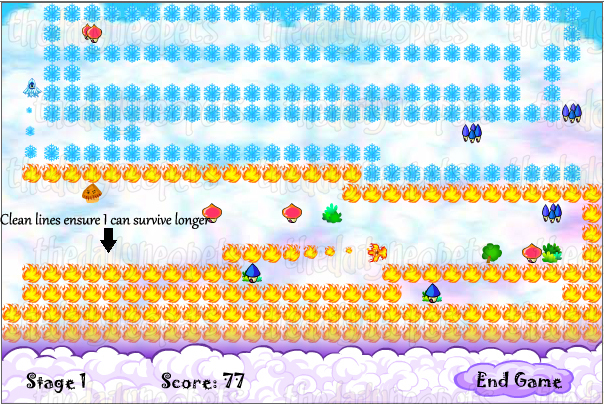 For the first 4 levels, the number of obstacles on the screen increases each round. Starting at level 5, the speed of you and your opponent will begin to increase each round. After each level, your score is added to scores from previous levels to get your total game score. There is one cheat that can be used once during the game. 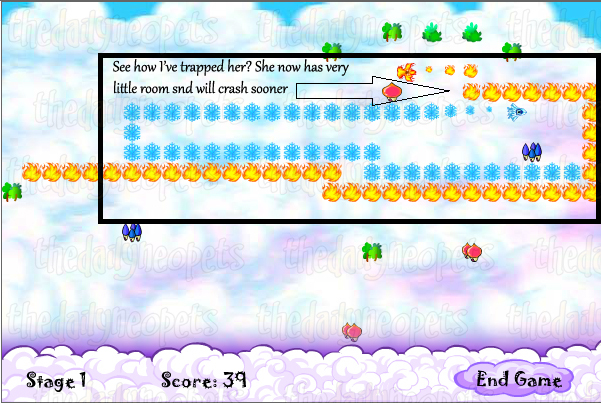 Typing in "faerie" during gameplay will clear all obstacles (except for trails and racers) from the screen. Use it wisely! The simplest way to keep your lines neat and more open space to work with is to simply follow the edge of the screen. While you still have to avoid obstacles periodically, this allows you to roam relatively unhindered, as the opponents you face down have a tendency to crash just fine without your help. Combining these two strategies is the best way to secure a faster win, increasing the number of points you can get from the levels. While the game is rather simple, mastering it can take some practice. Try out different strategies to see what works best for you. Make sure to celebrate when you defeat Queen Fyora! 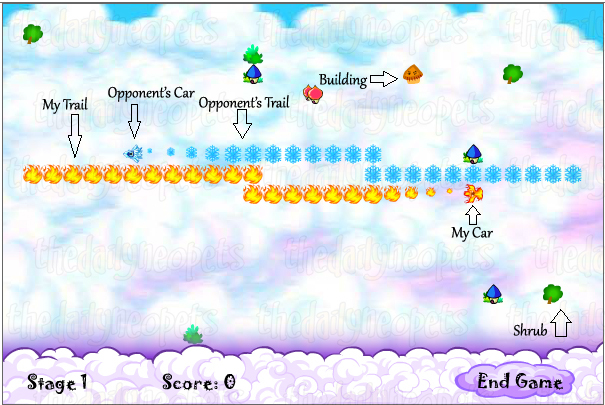 If you like this game, there is another version of the game, Extreme Faerie Cloud Racers which is just as much fun!